Taking flight HY-512 from Seoul at 15:40. Transfer to the hotel and accommodation. Rest after a long flight. Light snack in the hotel. Early flight to Bukhara at 6:30. Arrive to Bukhara at 08:15. Meeting and accommodation in the hotel. 10.00 - City tour: Ark - the center of Bukhara statehood (4th c. BC), complex Poi Kalon ("Beneath the Great"): "Kalyan Minaret" - the main symbol of sacred Bukhara that symbolized the authority and power of spiritual governors. (12th c.), "Kalyan Mosque"- its area of 130x80 m surpasses Bibi-Khanym mosque in Samarkand, "Miri Arab Madrassah" - active madrassah is one of the most esteemed spiritual Islamic universities (16th c.), Taki Zargaron - the dome of jewelers (15-16th cc. ), Ulugbeg Madrassah - one of the 3 madrassahs constructed by the grandson of Tamerlan - Ulugbeg (15th c.). 13:00 - Lunch time in the hotel. 19:00 - Dinner with folklore show in Nodir Divan Begim Madrassah. One of the "1000 and 1 nights" in Bukhara. Transfer to Samarkand via Shakhrisabz - a unique monument of town-planning and architecture (270 km, 3,5 hrs). Shakhrisabz tour: ruins of "Ak-Saray Palace" - Tamerlan's summer residence that shocked the imagination of his contemporaries (14-15th c.), "Jahongir Mausoleum"- mausoleum of Tamerlan's eldest and favorite son (14th c.), complex "Dor-ut Saodat": "Khazratiy Imam Mosque" - the multi-stage mosque with domical hall with decorated ayvans (14th c.), "Gumbazi-Seiidan" - mausoleum of possible offspring of Temur, "Kok Gumbaz Mosque" ("Blue dome") - built by Ulugbek on behalf of his father Shahruh (15th c). The Golden Road to the historical town of Samarkand - a crossroad of the world's cultures, one of the most ancient cities in the world (90 km, 1,5 hrs). Hotel accommodation and free time. Overnight in the city that is a contemporary of ancient Rome and has a history of more than 2500-years. 13:00 - Lunch in local cafe in Shahkrisabz. 14:00 - Transfer to Samarkand (270 km, 2,5 hrs). Arrive and accommodation in the hotel. 17:00 - Visiting Bibi-Khanym (14th c.), built by Timur to be biggest mosque at time. Architect, craftsmen & painters built it in 5 years. Siab bazaar (is closed on Mon). 19-00 - Dinner in the hotel. Overnight in Samarkand. Breakfast. City tour: Gur Emir Mausoleum - Tamerlan's tomb (14-15th c.) that was built for Temur's grandson Muhammad-Sultan and tombs of three other Temurids - sons of Temur - Miranshah and Shahruh and his grandson Ulugbek, Registan Square ("A sandy place") - the major square of Samarkand: "Ulugbeg Medressa" - Sheikh Khodja Akhrar and poet Djami were among outstanding graduates of the medressa (15th c.), "Sher-Dor Medressa" ("Having tigers") (17th c.), "Tillya-Kari Medressa" ("Coated by gold") - the rich gilding on the dome, walls and mihrab surpassed all famous buildings in Central Asia (17th c). An architectural complex Shahi-Zinda ("Alive king") - necropolis on the slope of the Afrosiab hill is connected with Kusam ibn Abbas - the cousin of Prophet Muhammad (11-15th c.). 13-00 - Lunch in local cafe during excursion. 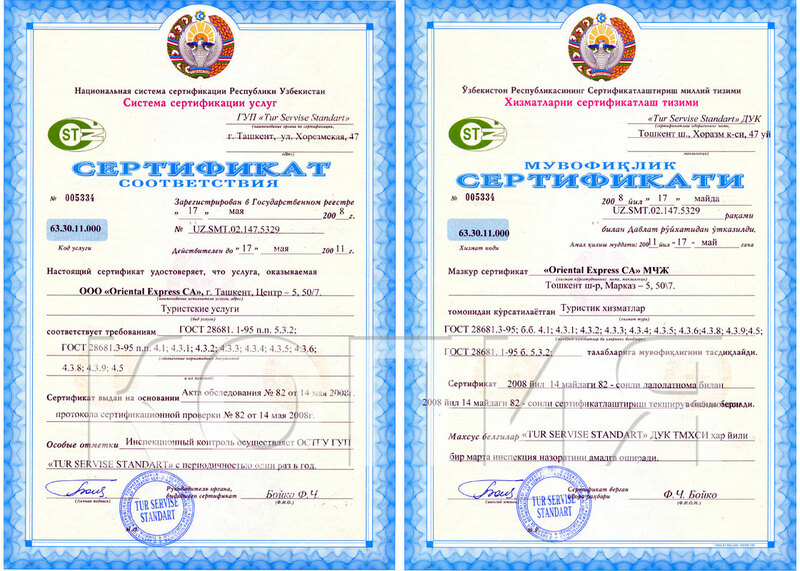 Transfer to railway station for train to Tashkent by "Registan" at 17:00-20:50. Boxed-dinner at the train. Arrival and transfer to the airport for flight to Seoul by HY-511 at 23:20. - No early arrivals and late departures are included. Additional supplements could be offered depending to the international flight tourist used. 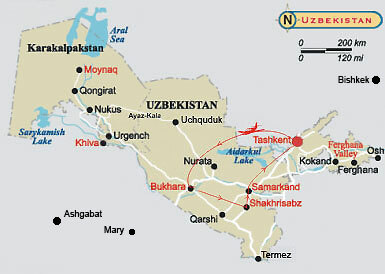 Uzbekistan waits to welcome You! You can alter the duration of your tour and places of visits by adding one of the extensions. Our tour operator will work closely with to carefully prepare an itinerary based on your stated interests. OrexCA.com - Your Ultimate Virtual Travel Guide in Central Asia!